The D-backs are flying under the radar in the up-for-grabs NL West, but this is a team for the others to fear. In winning the division in ’07, the D-backs were considered precocious, with such “kids” as Mark Reynolds, Chris Young, Stephen Drew and Justin Upton playing major roles. Well, the kids have grown up and form the nucleus of an impressive lineup. The back of the bullpen is a major concern, but precedent fuels optimism regarding anointed closer Chad Qualls, who has a total of 15 saves in five seasons: the D-backs gambled in 2007 with Jose Valverde, and he covered the bets with 47 saves. Furthermore, any rotation headed by Brandon Webb and Dan Haren has to be respected. Then there’s high-potential Max Scherzer, a chief reason Arizona signed free-agent innings-eater Jon Garland. BERNIE WILLIAMS: The accomplished guitarist will debut his second CD on April 14. It is titled “Moving Forward.” Perhaps it should instead be called “Moving Backward,” given Bernie’s hope that his play for Puerto Rico in the upcoming World Baseball Classic might lead to a Major League comeback. Williams, who has begun to write and arrange his own stuff, is totally committed to the music career. But he entertains the baseball whimsy with perfect logic. An ironic admission: “Days Are Numbered” was a hit for the Alan Parsons Project on its “Vulture Culture” album. Williams has sat out two full seasons since his fallout with the Yankees. But he is just one of many players who have heard MLB’s siren song and are working this Spring Training to resume careers after long absences. There is Corey Koskie, the third baseman who has been missing since suffering a severe concussion on July 5,2006. Canadian Koskie, like Williams, hopes his upcoming WBC play might entice a team into giving him a comeback shot. And Lance Niekro, who last appeared in the Majors as a first baseman on May 2, 2007 with the Giants and is attempting a comeback as a pitcher featuring the knuckleball – an homage to his late father, Joe Niekro. And Jose Valentin, hoping to hook on with the Mets a year-and-a-half after his last at-bat for them. I’m not a collector. Have spent most of my adult life around baseball cards come to life, so never had a desire to gather the bubble-gum smeared cards in shoeboxes. However, one time I couldn’t resist morphing from professional sportswriter to fawning little kid — and Ken Griffey Jr.’s return to Seattle brings it all back. 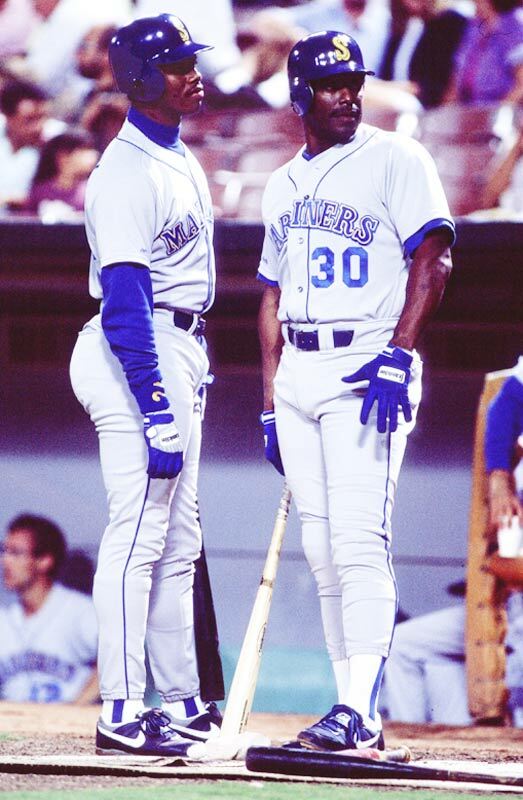 In 1990, he literally was The Kid, a 20-year-old playing through his second season with the Mariners. Pop was nearing the end of his 18th season, sitting on the Reds bench that may as well have come equipped with rockers. Ken Griffey Sr. saw the sands of time trickling out of his career and was overtaken by a desire to connect with his Kid in a very real sense. He convinced the Reds to release him on Aug. 24, and five days later was signed by the Mariners. On Aug. 31, the M’s unveiled their cross-generational lineup: Senior playing left and batting second, Junior batting third and playing center. They both hit the cover off the ball for two weeks. Then the Mariners pulled into Anaheim for a series against the Angels. Two teams going nowhere, playing out the string, just trying to stay ahead of the chill of the offseason. Then, on Sept. 14, in the second game of the four-game series, some of the magic dust from nearby Disneyland descended over Anaheim Stadium. In the first inning, Senior swung at a choice 0-and-2 pitch from right-hander Kirk McCaskill and sent it on a line over the left-center fence for a home run. He circled the bases and was welcomed home by a warm hug from the on-deck batter, Junior. Then The Kid stepped into the box. The count reached 3-and-0; green-lighted Junior cut at McCaskill’s low-and-outside heater and lined it over the left-center fence for his home run. Father and son, back-to-back. Never happened before, likely to never happen again. I worked the Seattle clubhouse after the game, as usual my scorebook tucked under my notepad for reference. As I approached the Griffeys, side-by-side also in the locker room, the singularity of their achievement struck me. I asked both to sign my scoresheet, and they happily obliged. One below the other, adjacent to their “home run” notations. It’s the only piece of memorabilia I have, framed on the wall of my office. So, welcome back to the site of the miracle, Junior. Here’s what I love about the Manny Ramirez situation: It’s a good old-fashioned holdout, that long-lost tradition which used to spice Spring Trainings. With the Dodgers his lone overt suitor, this isn’t about maximizing free agency, but about holding out until El Lay sweetens the deal. This bit of flashback couldn’t be better placed. The Dodgers have a rich lore of holdout episodes, most starring that late agitator of a GM, Buzzie Bavasi. Don Drysdale-Sandy Koufax, 1966 — The mound’s dynamic duo became a demonic duo for Bavasi, negotiating in tandem for a shared $1 million across three years (or $167,000 annually apiece at a time Willie Mays’ $125,000 topped baseball’s books). Don and Sandy did the Ed Sullivan Show in New York while the Dodgers were training in Vero Beach. The 32-day stalemate ended on March 31, with Koufax ($125,000) and Drysdale ($110,000) each signing one-year deals. JOE TORRE: Fans don’t share the frothing New York media’s verdict that “The Yankee Years” soiled his Bronx heritage. In an ongoing New York Daily News poll, their sentiment is 69-to-31 for retiring his No. 6 over dismissing him for having tarnished his legacy.